or SR ( bolts perfectly to bracket (duh) but needs large line modified and a/c recharged. as for the wiring, wire the SR motor as its always done, but there is a difference in the way USDM and JDM a/c compressor clutch signal is routed. in the USDM s13, the a/c clutch wire (blue/grn stripe) comes from the body harness, where as in the JDM S13, it comes off the ECCS harness. then, at the blue ECU plug, pin 41 goes to the white underdash plug, make sure that the blue/grn wire running from pin 41 going to the white underdash plug makes connection with the blue/grn underdash wire (that is the a/c on signal from your HVAC control panel. signal from HVAC control panel to pin 41 on ecu, tells ecu to kick up idle, simultaneously, ecu sends signal along green/yellow wire to the a/c relay — kicking it on, which sends power to the blue/grn wire running in the body harness to the a/c compressor clutch, activating the clutch and making the compressor work.” ———————————– AC wiring for s13 into s14.. Easy way.. Go to F3 plug and wire in black/pink (not the fuel pump lead) to yellow w/black. The black w/ pink once it receives a ground will kick AC relay on. The yellow w/black becomes a ground once you hit the AC button. This like Taylor said is a ok way of doing it. 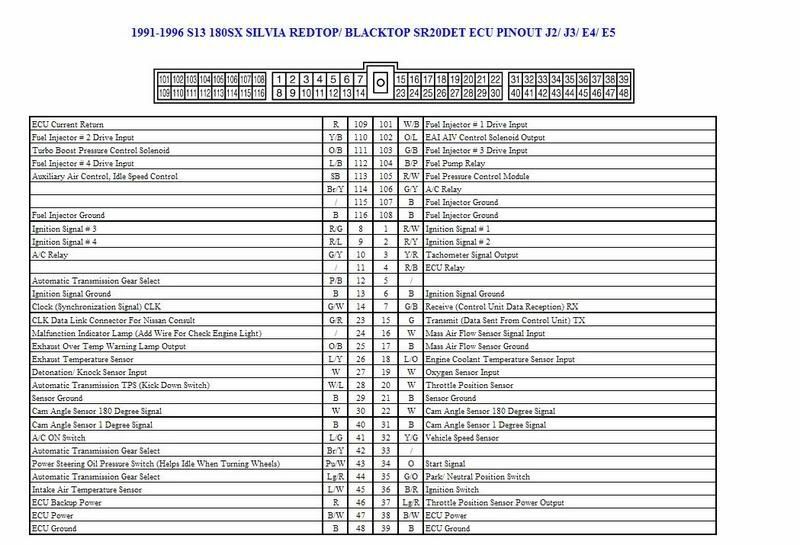 The reason why AC signal goes into the ECU and out to the body harness is because the ECU decides weather or not it will let you kick it on… again like Taylor said… WOT.. and there are some others.. engine temp over 188 F or RPM above i think 5500. The relay gimmick is the more proper way of doing it. 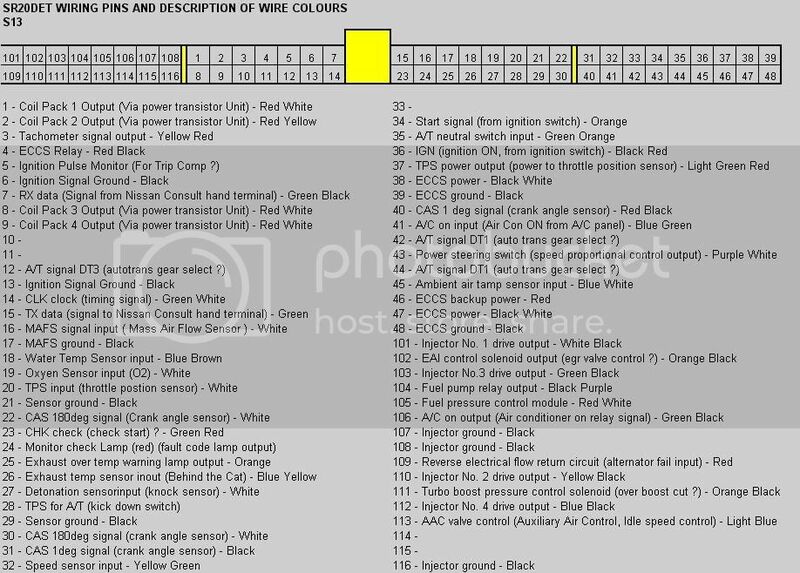 Since a S13 ECU receives and puts out a 12V signal rather than a ground to trigger the AC relay, you need to take the F3 yellow w/ black wire and supply it as a trigger to a relay that will supply 12V into the S13 ECU AC input. Then take the 12V S13 ECU AC out (both these are blue/green) and use it as a trigger for a second relay. This relay will swith a ground though which will feed the black w/ pink on the F3 plug to actually trigger the AC relay in the relay box. 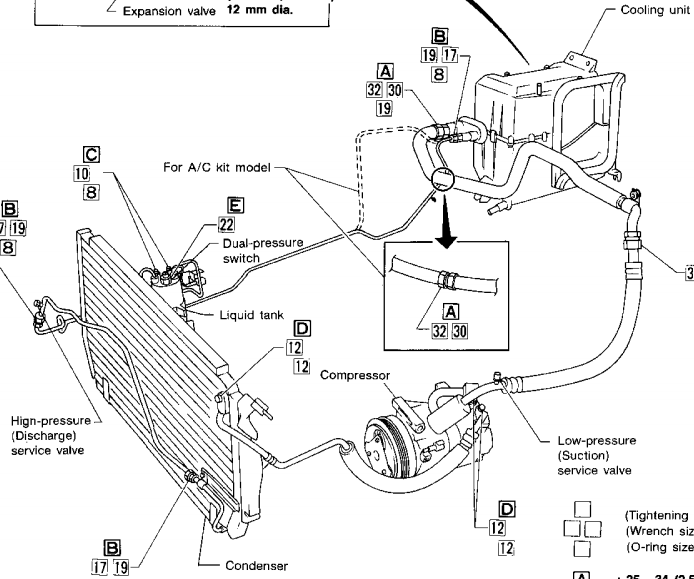 If you do it the first way you will need to also tap into the AC wire going to your compressor and send this over to your Idle Air Controller Valve (tap the blue /green wire going to it. The second way actually does it for you because the blue/gree out coming out of the ECU branches and goes directly to that. Now you have functioning AC and a good idle I made a quick sketch… I will update it tomorrow with pin numbers. Class dismissed.